On November, 8 MagneticOne, developer of File2Cart turns 11. These were 11 years of hard work, innovative solutions, grand ideas - all these to make your business more profitable and your store management more advanced. It's your day too! Thank you for being there for us, for your trust and loyalty. Purchase credits with minimum $50 payment and add 25% of the sum to your File2Cart account. Spend less and import more with File2Cart. Get Daily Full Store Functionality Report for only $18.99! Check your store functionality regularly with 5% discount. 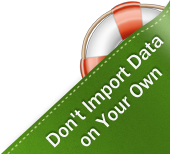 Use this coupon code: M1BD5 to get full report of store errors and possible resolutions. Make your store clockwork with Shopping Cart Diagnostics! Grab your chance to benefit from MagneticOne birthday bonus!